Elise Higgins-Steele, an eighth-grade English Language Arts teacher at Sterling Middle School in Quincy, Massachusetts, had become so disenchanted by the stifling requirements of the curriculum, she was considering a career change. Her decision to do something more, rather than calling it quits, led her to an exciting new project. Thanks to a successful partnership between Hearts on Fire and Skype in the Classroom, teachers now have access to inspiring speakers and innovative content online. Speakers on the Hearts on Fire Visionary page know how to ignite students’ natural curiosity and idealism and show them the impact just one person can have on the world. That’s where Elise came across the Girl Rising curriculum. Girl Rising is a global campaign for girls’ education and empowerment. It uses the power of storytelling, through film and other media, to change the way people think about and value girls and girls’ education. The animated discussions opened a whole new dimension of interest and excitement among the students and, in the end, Elise says, even the boys were engaged. Elise admits that incorporating the Girl Rising curriculum takes commitment. For her it meant setting aside 50-minute blocks for six weeks. Plus: She got the community involved by holding screenings of the documentary, Girl Rising, and other videos. 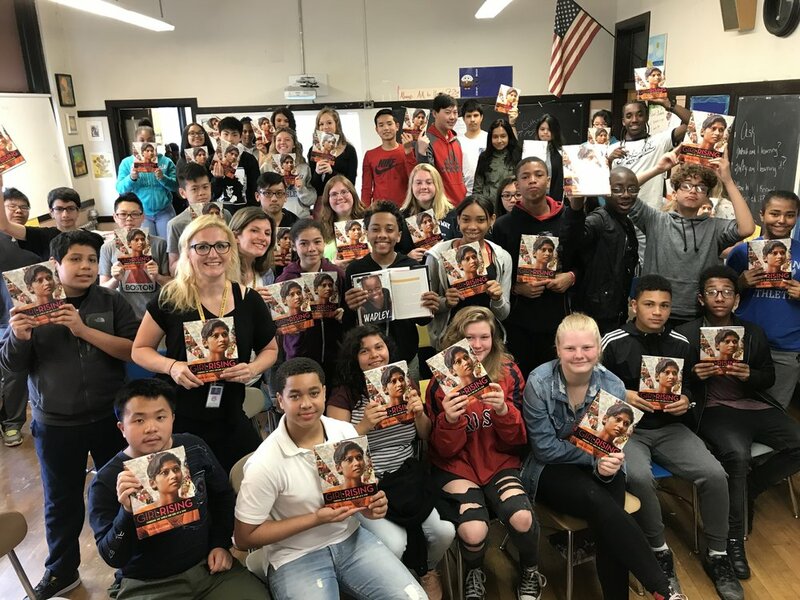 Using the tools available through the Hearts on Fire/Skype in the Classroom initiative, teachers have a free path to fostering empathy in students and making them global citizens, interested in issues far beyond their own backyard. Leslie Schaffer, a ninth-grade Social Studies teacher at the Drew Charter School in Atlanta, Georgia, agrees. Her school couples STEAM with project-based learning, setting the stage for students to solve actual world problems. Using a simple laptop with a built-in microphone, Leslie connected her class with Girl Rising Senior Producer, Kayce Freed Jennings, whose descriptions of the Girl Rising content were so cool the kids were drawn in and fired up, including the boys. Leslie’s class was so engaged, they wanted the entire 9th grade to be involved in the GR project across all disciplines. And it happened. The English class did spoken word poetry, in Science they focused on the achievements of women scientists, Math class gathered data on gender roles, Geography students annotated a large map of Africa with tribal boundaries and current boundaries and the impact of disease. Meanwhile, Art class contributed brilliant visual displays. Leslie envisions a day when students have their own platform to access the brightest minds, the innovators of social change, and students like themselves living in radically different cultures and circumstances around the globe. “I would love for my kids to be able to go into Skype in the Classroom to search for and find content area experts they can connect to themselves,” says Leslie. Whether they’re in grade school or high school, whether they are passionate about animals, the planet, or everyday issues like bullying, students can visit www.HeartsonFire.org and read about young Visionaries who are making a difference in big and small ways, and learn how they, too, can Be the Spark that changes the world.